Lilly is the daughter of our lovely late broodmare Castanet. We loved Castanet so much that when Tiger Lilly came up for sale we just had to have her! Lilly is a Dutch WB mare with 3 generations of FEI competitors. Her Sire Ijsselmeer showed Grand Prix, Her Grand sire & Great Grand sire competed at Intermediare & Grand Prix. Chrysos was Pan Am Games Silver Medalist & was leading sire of USDF HOY qualifiers for years.She is approved ISR/Oldenburg and her foals are eligible for KWPN-NA registration for Dutch and ASA stallions Her height of 15.1 hands makes her an excellent sport pony broodmare! 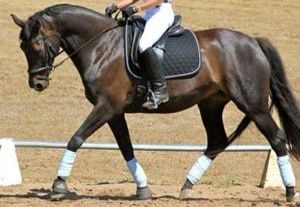 "Cassy" is a beautiful modern type mare with huge elastic gaits! She is a main mare book Oldenburg. She also is in the Hauptsutbuch(main mare book) for Westfalen. Her father Guaranter successfully competed through Prix St. Goerge. He has the legendary bloodline of Grande whose offspring for decades dominated the sport horse world in both dressage and jumping.Her Grand sire Chrysos was Pam Am Games Silver Medalist & was leading sire of USDF HOY qualifiers for years. "Cassy's" being only 15.1 hand makes her an excellent cross with smaller ponies to get the perfect sport pony! sadly we had to put Cassy down. But we are lucky enough to have hwe daughter Tiger Lily as one of our outstanding broodmares! 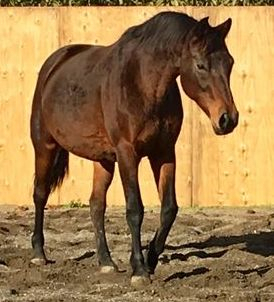 Risa is a very lovely Sweedish mare who was owned and bred by Con Brio Farms. In 2012 Con Brio Farms sold off most of there broodmares and only kept a few high quality mares to breed. Now they have closed the doors on their breeding program and we are lucky enough to be able to purchase Risa for our breeding program! Risa is by the Elite Grand Prix stallion Rubignon & out of a Premium mare by Rampal. Risa has produced many beautiful and small offspring for Con Brio Farms. Her first foal Cirrus was the #1 DSHB Maiden Mare for KWPN. And was Reserve Champion Material 4 & 5 year old mare. 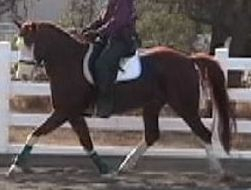 A beautiful 13.2 hand RSPI approved Welsh mare with a gorgeous head and neck! She has 3 lovely gaits with one of the biggest trots we have ever seen on a pony! 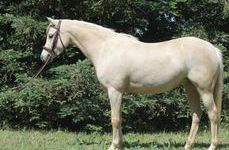 Valentine is a lovely 12.2 hand light palomino mare. By the very well known stallion Evens Providence of the night! She inherited her outstanding movement from her sire! Valentine has been inspected and received mare book #1 premium status for both Weser Ems and RSPI registries. She was the 3rd highest scoring mare of the year for the RSPI inspection tour. Her sire Lanciano is a all purpose sire who is one of the most used sires in Europe! He is firmly established in the breeding wold and is a pacemaker of the modern riding horse type. He passes along his brilliant movement and his steadfast reliability. Linka carries the blood of Weltmyer,Prince Thatch , Landgraf & Pilot. Her grand sire Weltmeyer was named Stallion of the century!! I feel so lucky to have this outstanding mare in my brood mare herd!